Volcanoes are an impressive force of nature. Physically, they dominate the landscape, and have an active role in shaping our planet’s geography. When they are actively erupting, they are an extremely dangerous and destructive force. But when they are passive, the soil they enrich can become very fertile, leading to settlements and cities being built nearby. Such is the nature of volcanoes, and is the reason why we distinguish between those that are “active” and those that are “dormant”. But what exactly is the differences between the two, and how do geologists tell? This is actually a complicated question, because there’s no way to know for sure if a volcano is all done erupting, or if it’s going to become active again. Put simply, the most popular way for classifying volcanoes comes down to the frequency of their eruption. Those that erupt regularly are called active, while those that have erupted in historical times but are now quiet are called dormant (or inactive). But in the end, knowing the difference all comes down to timing! Currently, there is no consensus among volcanologists about what constitutes “active”. Volcanoes – like all geological features – can have very long lifespans, varying between months to even millions of years. In the past few thousand years, many of Earth’s volcanoes have erupted many times over, but currently show no signs of impending eruption. As such, the term “active” can mean only active in terms of human lifespans, which are entirely different from the lifespans of volcanoes. Hence why scientists often consider a volcano to be active only if it is showing signs of unrest (i.e. unusual earthquake activity or significant new gas emissions) that mean it is about to erupt. The Smithsonian Global Volcanism Program defines a volcano as active only if it has erupted in the last 10,000 years. Another means for determining if a volcano is active comes from the International Association of Volcanology, who use historical time as a reference (i.e. recorded history). By this definition, those volcanoes that have erupted in the course of human history (which includes more than 500 volcanoes) are defined as active. However, this too is problematic, since this varies from region to region – with some areas cataloging volcanoes for thousands of years, while others only have records for the past few centuries. As such, an “active volcano” can be best described as one that’s currently in a state of regular eruptions. Maybe it’s going off right now, or had an event in the last few decades, or geologists expect it to erupt again very soon. In short, if its spewing fire or likely to again in the near future, then it’s active! Meanwhile, a dormant volcano is used to refer to those that are capable of erupting, and will probably erupt again in the future, but hasn’t had an eruption for a very long time. Here too, definitions become complicated since it is difficult to distinguish between a volcano that is simply not active at present, and one that will remain inactive. Volcanoes are often considered to be extinct if there are no written records of its activity. Nevertheless, volcanoes may remain dormant for a long period of time. For instance, the volcanoes of Yellowstone, Toba, and Vesuvius were all thought to be extinct before their historic and devastating eruptions. The same is true of the Fourpeaked Mountain eruption in Alaska in 2006. Prior to this, the volcano was thought to be extinct since it had not erupted for over 10,000 years. Compare that to Mount Grímsvötn in south-east Iceland, which erupted three times in the past 12 years (in 2011, 2008 and 2004, respectively). And so a dormant volcano is actually part of the active volcano classification, it’s just that it’s not currently erupting. Geologists also employ the category of extinct volcano to refer to volcanoes that have become cut off from their magma supply. There are many examples of extinct volcanoes around the world, many of which are found in the Hawaiian-Emperor Seamount Chain in the Pacific Ocean, or stand individually in some areas. For example, the Shiprock volcano, which stands in Navajo Nation territory in New Mexico, is an example of a solitary extinct volcano. Edinburgh Castle, located just outside the capitol of Edinburgh, Scotland, is famously located atop an extinct volcano. But of course, determining if a volcano is truly extinct is often difficult, since some volcanoes can have eruptive lifespans that measure into the millions of years. As such, some volcanologists refer to extinct volcanoes as inactive, and some volcanoes once thought to be extinct are now referred to as dormant. In short, knowing if a volcano is active, dormant, or extinct is complicated and all comes down to timing. And when it comes to geological features, timing is quite difficult for us mere mortals. Individuals and generations have limited life spans, nations rise and fall, and even entire civilization sometimes bite the dust. But volcanic formations? They can endure for millions of years! Knowing if there still life in them requires hard work, good record-keeping, and (above all) immense patience. We have written many articles about volcanoes for Universe Today. Here’s Ten Interesting Facts About Volcanoes, What are the Different Types of Volcanoes?, How Do Volcanoes Erupt?, What is a Volcano Conduit?, and What are the Benefits of Volcanoes? Few forces in nature are are impressive or frightening as a volcanic eruption. In an instant, from within the rumbling depths of the Earth, hot lava, steam, and even chunks of hot rock are spewed into the air, covering vast distances with fire and ash. And thanks to the efforts of geologists and Earth scientists over the course of many centuries, we have to come to understand a great deal about them. However, when it comes to the nomenclature of volcanoes, a point of confusion often arises. Again and again, one of the most common questions about volcanoes is, what is the difference between lava and magma? They are both molten rock, and are both associated with volcanism. So why the separate names? As it turns out, it all comes down to location. As anyone with a basic knowledge of geology will tell you, the insides of the Earth are very hot. As a terrestrial planet, its interior is differentiated between a molten, metal core, and a mantle and crust composed primarily of silicate rock. Life as we know it, consisting of all vegetation and land animals, live on the cool crust, whereas sea life inhabits the oceans that cover a large extent of this same crust. However, the deeper one goes into the planet, both pressures and temperatures increase considerably. All told, Earth’s mantle extends to a depth of about 2,890 km, and is composed of silicate rocks that are rich in iron and magnesium relative to the overlying crust. Although solid, the high temperatures within the mantle cause pockets of molten rock to form. This silicate material is less dense than the surrounding rock, and is therefore sufficiently ductile that it can flow on very long timescales. Over time, it will also reach the surface as geological forces push it upwards. This happens as a result of tectonic activity. Basically, the cool, rigid crust is broken into pieces called tectonic plates. These plates are rigid segments that move in relation to one another at one of three types of plate boundaries. These are known as convergent boundaries, at which two plates come together; divergent boundaries, at which two plates are pulled apart; and transform boundaries, in which two plates slide past one another laterally. Interactions between these plates are what is what is volcanic activity (best exemplified by the “Pacific Ring of Fire“) as well as mountain-building. 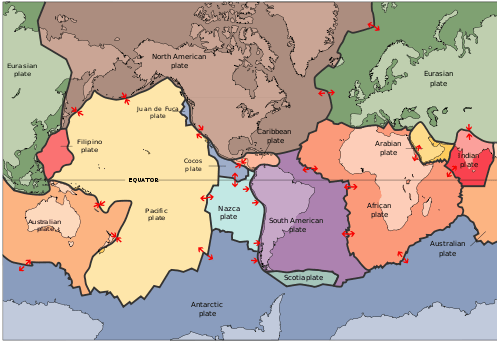 As the tectonic plates migrate across the planet, the ocean floor is subducted – the leading edge of one plate pushing under another. At the same time, mantle material will push up at divergent boundaries, forcing molten rock to the surface. As already noted, both lava and magma are what results from rock superheated to the point where it becomes viscous and molten. But again, the location is the key. When this molten rock is still located within the Earth, it is known as magma. The name is derived from Greek, which translate to “thick unguent” (a word used to describe a viscous substance used for ointments or lubrication). It is composed of molten or semi-molten rock, volatiles, solids (and sometimes crystals) that are found beneath the surface of the Earth. This vicious rock usually collects in a magma chamber beneath a volcano, or solidify underground to form an intrusion. Where it forms beneath a volcano, it can then be injected into cracks in rocks or issue out of volcanoes in eruptions. The temperature of magma ranges between 600 °C and 1600 °C. Magma is also known to exist on other terrestrial planets in the Solar System (i.e. Mercury, Venus and Mars) as well as certain moons (Earth’s Moon and Jupiter’s moon Io). In addition to stable lava tubes being observed on Mercury, the Moon and Mars, powerful volcanoes have been observed on Io that are capable of sending lava jets 500 km (300 miles) into space. When magma reaches the surface and erupts from a volcano, it officially becomes lava. There are actually different kinds of lava depending on its thickness or viscosity. Whereas the thinnest lava can flow downhill for many kilometers (thus creating a gentle slope), thicker lavas will pile up around a volcanic vent and hardly flow at all. The thickest lava doesn’t even flow, and just plugs up the throat of a volcano, which in some cases cause violent explosions. The term lava is usually used instead of lava flow. This describes a moving outpouring of lava, which occurs when a non-explosive effusive eruption takes place. Once a flow has stopped moving, the lava solidifies to form igneous rock. Although lava can be up to 100,000 times more viscous than water, lava can flow over great distances before cooling and solidifying. The word “lava” comes from Italian, and is probably derived from the Latin word labes which means “a fall” or “slide”. The first use in connection with a volcanic event was apparently in a short written account by Franscesco Serao, who observed the eruption of Mount Vesuvius between May 14th and June 4th, 1737. Serao described “a flow of fiery lava” as an analogy to the flow of water and mud down the flanks of the volcano following heavy rain. Such is the difference between magma and lava. It seems that in geology, as in real estate, its all about location! We have written many articles about volcanoes here at Universe Today. Here’s What is Lava?, What is the Temperature of Lava?, Igneous Rocks: How Are They Formed?, What Are The Different Parts Of A Volcano? and Planet Earth. By definition, pollution refers to any matter that is “out of place”. In other words, it is what happens when toxins, contaminants, and other harmful products are introduced into an environment, disrupting its normal patterns and functions. When it comes to our atmosphere, pollution refers to the introduction of chemicals, particulates, and biological matter that can be harmful to humans, plants and animals, and cause damage to the natural environment. Whereas some causes of pollution are entirely natural – being the result of sudden changes in temperature, seasonal changes, or regular cycles – others are the result of human impact (i.e. anthropogenic, or man-made). More and more, the effects of air pollution on our planet, especially those that result from human activity, are of great concern to developers, planners and environmental organizations, given the long-term effect they can have. Venus is often referred to as “Earth’s Twin” (or “sister planet”), and for good reason. Despite some rather glaring differences, not the least of which is their vastly different atmospheres, there are enough similarities between Earth and Venus that many scientists consider the two to be closely related. In short, they are believed to have been very similar early in their existence, but then evolved in different directions. Earth and Venus are both terrestrial planets that are located within the Sun’s Habitable Zone (aka. “Goldilocks Zone”) and have similar sizes and compositions. Beyond that, however, they have little in common. Let’s go over all their characteristics, one by one, so we can in what ways they are different and what ways they are similar. A team of researchers at India’s Physical Research Laboratory (PRL) claims it has found evidence of relatively recent volcanic activity on the Moon, using data from NASA’s Lunar Reconnaissance Orbiter and the Chadrayaan-1 spacecraft. According to the findings the central peak of Tycho crater contains features that are volcanic in origin, indicating that the Moon was geologically active during the crater’s formation 110 million years ago. In an article by the Deccan Herald, a Bangalore-based publication, the PRL researchers claim that vents, lava channels and solidified flows of inner crustal material found within Tycho were made as recently as 100 million years ago — after the creation of the crater. This could indicate that there was pre-existing volcanic activity within the Moon at the site of the Tycho impact, lending credence to the idea that the Moon was recently geologically active. In addition, large boulders ranging in size from 33 meters to hundreds of yards across have been spotted on Tycho’s central peaks by LRO, including one 400-foot (120-meter) -wide specimen nestled atop the highest summit. How did such large boulders get there and what are they made of? The researchers hint that they may also be volcanic in origin. “A surprise findings revealed the presence of large boulders–about 100 meter in size –on top of the peak. 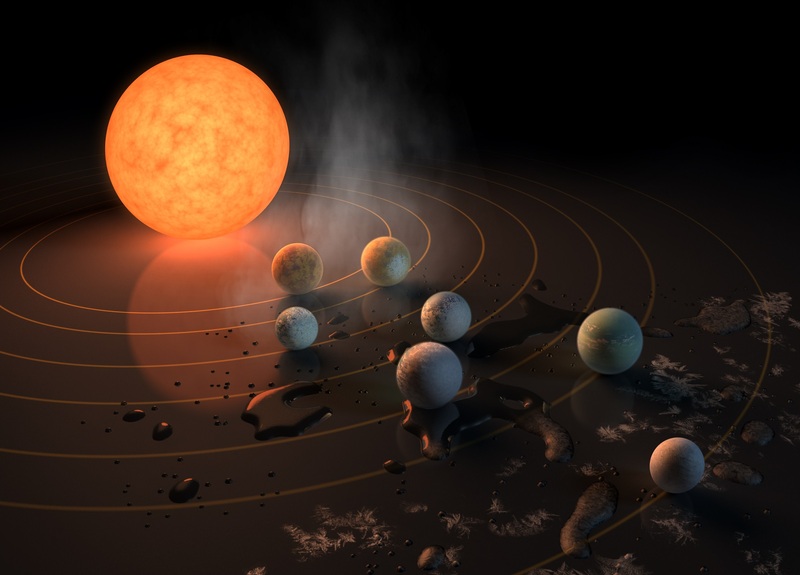 Nobody knew how did they reach the top,” said Prakash Chauhan, a PRL scientist. Without further studies it’s difficult to determine the exact origin and ages of these lunar formations. The team awaits future research by Chandrayaan-II, which will examine the Moon from orbit as well as land a rover onto the lunar surface. Chandrayaan-II is expected to launch in early 2014. The PRL team’s findings were published in the April 10 issue of Current Science. Read the article in the Deccan Herald here.